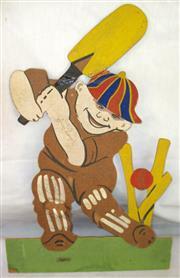 Figure of a Cricketer. A Batsman Being Bowled. Made from cardboard (some repairs). Signed by Sydney Smith, Manager of Australian Cricketers of the 1920s, five other cricketers have signed including Stan McCabe. A very unusual item from the twenties.